Of course, in reality we’re often forced to play Tetris with our stuff, pushing, squeezing, and cramming it all into spaces that feel way too small. 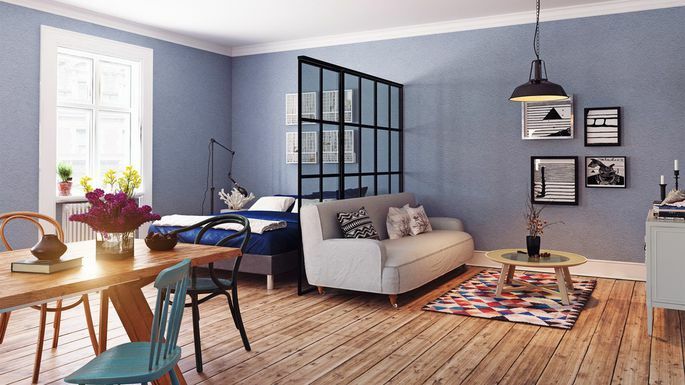 But even if you don’t live in a mansion, it’s possible to mold rooms into practical spaces that meet varied needs, notes Monica Friel, owner of Chaos to Order in Chicago. “The most important part of making any room function—especially when it has more than one purpose—is having things optimally organized,” she says. That means choosing furniture and storage systems by paying equal attention to form and livability. With that in mind, here’s how to create dual-use spaces that work seamlessly for everyone in your home—last-minute guests included. So you’ve got an extra room (lucky!). 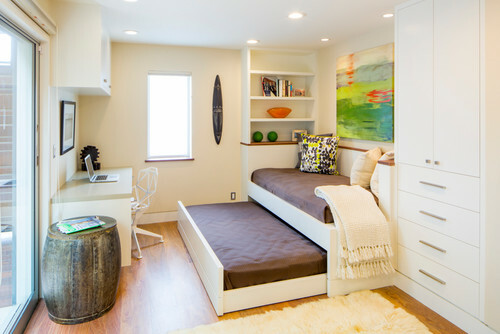 You don’t have to choose between furnishing it as a guest bedroom or a home office. You can actually have both, so Aunt Edna doesn’t need to sleep with her head next to the printer when she comes to visit. Set up your office first, because that’ll likely be the room’s primary use. Then prioritize comfort for your visitors by keeping work gear in its (barely noticeable) place. This isn’t a sloppy cubicle—your home office/guest room needs to stay pristine. Hardworking furniture—such as a sleeper sofa that doubles as seating by day and a bed by night—just makes sense. Conceal bulky office equipment with a Japanese-style screen, and use a posh storage ottoman to stash office supplies and offer visitors a place to put their feet up, Alcabes says. The living room is ideally a comfy retreat for the family to watch TV, and perhaps for the grown-ups to enjoy a cocktail or two after the kids’ bedtime. 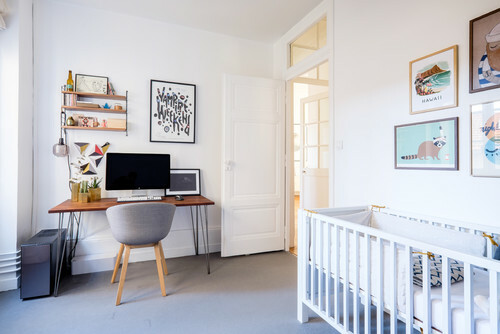 But being a parent doesn’t have to mean your living room becomes a distracting plastic paradise, according to Laura Kinsella, owner of Urban OrgaNYze in New York City. “Toys are naturally bright and colorful for children to learn and develop, but their storage doesn’t need to be,” she says. Beautifully woven baskets can be an attractive solution for keeping blocks, books, and baby dolls out of sight. But before you toss everything into a pretty bin or basket, take inventory. Draw boundaries by limiting the number of toys in the living room at any given time. Rotate in (and out) a few toys from their cache every day or so. Work-from-home parents know the dilemma of giving up a home office for their new bundle of joy. Not to worry, says Laura McHolm, co-founder of Northstar Moving and a professional home organizer. “Babies and workplaces have the same needs: They both need good lighting, quiet, and privacy, so it makes perfect sense to use the room this way,” she says. But every item in the room should be multifunctional, if possible. For example, choose a comfy glider where you can read and get work done. Invest in soft lighting (try an adjustable lamp with a dimming switch) that works for reading both “Goodnight Moon” and the latest quarterly revenue report. And don’t overlook the nursery closet as a potential workspace. 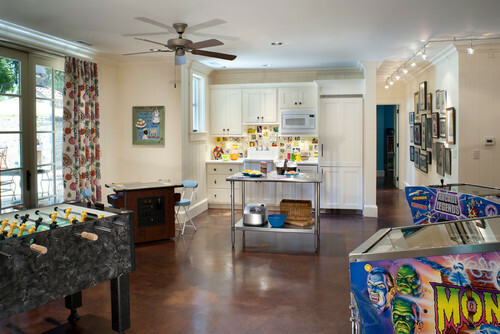 Playroom, man cave … what’s really the difference? McHolm doesn’t see much of one. “A pool table, foosball table, popcorn machine, and a big, flat-screen TV for movies and video games will be loved by both adults and kids,” she says. And adding strategic storage can keep the room functional for everyone who uses it. Japanese-style screens and roller shades can provided even more separation, if needed. Lastly, don’t forget the floors in a space that’s vulnerable to spills, says Connecticut designer Douglas Graneto. He recommends sophisticated but fun Flor carpet floor tiles. “They are extremely durable and easy to replace if a tile gets damaged,” he says. Open floor plans naturally pull double shifts every day. But with a shared living and dining area, you have to think separation of function for them to truly do both jobs adequately, Alcabes says. “You’ll want to visually divide the space … by arranging a seating area in the living section that backs up to the dining space,” she says. Using slightly different color schemes—perhaps bolder in the living area and softer tones in the dining space—you can create the illusion of two distinct areas. Consider other barriers such as columns, French doors, or bookcases to define the spaces as separate. Try putting casters on living room furniture to easily slide it out of the way for dinner parties, Alcabes suggests. 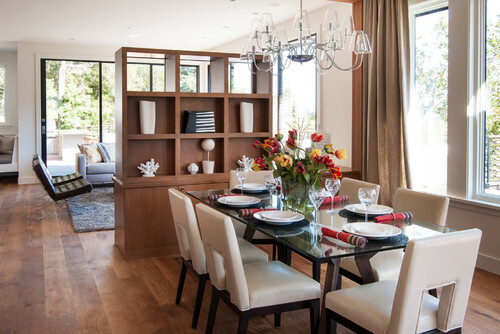 Plus, a hidden-leaf dining table can save everyday space and accommodate a crowd.